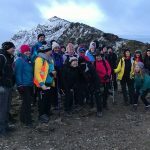 A unique opportunity to take part in the largest walking challenge in the world! The International Four Day Marches Nijmegen (or Vierdaagse – meaning Four Days) is the largest marching event in the world, held in Nijmegen (Netherlands) every year since 1916. Every year in July over 45,000 civilians and military teams march 30km, 40km or 50 km through the beautiful and historic towns and villages surrounding Nijmegen. Over 4 days and 4 different routes you will be supported by over 1 million people lining the streets to encourage and support you. Also known as ‘The Walk of the World’! We have put together an exclusive package just for you to include accommodation, food (breakfast and dinner) and all transfers at the destination. The guide price for this trip is £675 per person. To make sure you get a place on this trip you can register your interest now by contacting us. To join us for the 103rd Four Day Marches you will need to register for your place on the Viergaagse website. You can do this from 5th February 2019. By registering your interest in this trip there is no obligation to take part. We will be in touch in February to find out if you have registered for Vierdaagse and would still like a place. We will then provide information on how you can pay your deposit to secure your place. Registering your interest with us does NOT guarantee your place at the event. You will need to apply for your place in February which will be confirmed in April by the organisers. The Nijmegen Marches is a perfect opportunity to fundraise. If you decide to do this you can fundraise for a charity of your choice and there are NO minimum fundraising requirements. 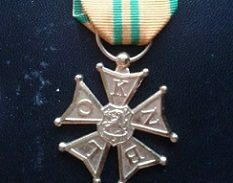 You can find out a personal experience of what it’s like to take part in the Nijmegen Marches here. 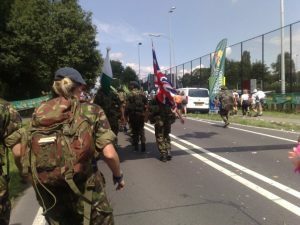 If you’d like a similar challenge closer to home our Snowdonia Challenge was inspired by Nijmegen Marches. We will need a minimum of 5 people with confirmed Nijmegen marches places to run this trip. Maximum 12. This is an example itinerary. The Nijmegen Marches is for everyone. However, don’t underestimate it. 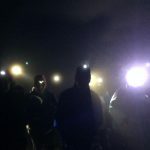 It will take a lot of determination and commitment to train for and complete this challenge. If you can do this you will have the adventure of a lifetime!